Lowes Motor Speedway officials recently announced that the Greatest World Wrestling Heavyweight Champion of all Time "Nature Boy" Ric Flair will serve as Honorary Race Director for the 25th running of the NASCAR Sprint All-Star Race on May 16. With the honorary title Flair will attend drivers meetings, assist SPEED with driver introductions for the NASCAR Sprint All-Star Race and serve on the panel of judges for the second annual Pennzoil Victory Challenge during the pre-race entertainment. 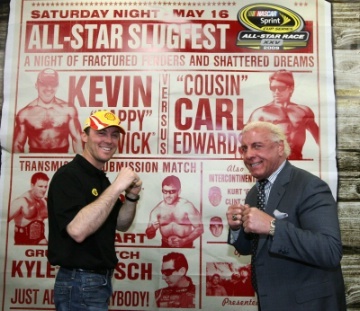 "I'm honored to be a part of the 25th running of the Sprint All-Star Race," said Flair. "I'm a long-time Charlotte resident and Lowe's Motor Speedway is an integral part of our city. It's one of the things that makes Charlotte a great place to live. There's nothing like NASCAR and the 'Nature Boy' to get you pumped up! WoooOOOooo!" "We've had some great personalities serve as dignitaries at the speedway over the years, but I have to admit, none have been stylin' and profilin' like the 'Nature Boy' will be at the 25th NASCAR Sprint All-Star Race," said Marcus Smith, president and general manager of Lowe's Motor Speedway. "Growing up in this area and watching Ric perform through the years, it's going to be a treat for me and all of the fans at the speedway. I can't think of a better fit for NASCAR's All-Star slugfest." In addition to Flair's role on race day, the Charlottean will be voicing the speedway's radio and television advertising campaign for the NASCAR Sprint All-Star Race that will begin airing very soon.